A computing platform or digital platform  is the environment in which a piece of software is executed. It may be the hardware or the operating system (OS), even a web browser and associated application programming interfaces, or other underlying software, as long as the program code is executed with it. 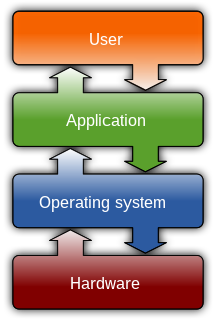 Computing platforms have different abstraction levels, including a computer architecture, an OS, or runtime libraries. A computing platform is the stage on which computer programs can run. An embedded system is a controller programmed and controlled by a real-time operating system (RTOS) with a dedicated function within a larger mechanical or electrical system, often with real-time computing constraints. It is embedded as part of a complete device often including hardware and mechanical parts. Embedded systems control many devices in common use today. Ninety-eight percent of all microprocessors manufactured are used in embedded systems. A web browser is a software application for accessing information on the World Wide Web. Each individual web page, image, and video is identified by a distinct Uniform Resource Locator (URL), enabling browsers to retrieve these resources from a web server and display them on the user's device. A scripting or script language is a programming language for a special run-time environment that automates the execution of tasks; the tasks could alternatively be executed one-by-one by a human operator. Scripting languages are often interpreted. AmigaOS is a family of proprietary native operating systems of the Amiga and AmigaOne personal computers. It was developed first by Commodore International and introduced with the launch of the first Amiga, the Amiga 1000, in 1985. Early versions of AmigaOS required the Motorola 68000 series of 16-bit and 32-bit microprocessors. Later versions were developed by Haage & Partner and then Hyperion Entertainment. 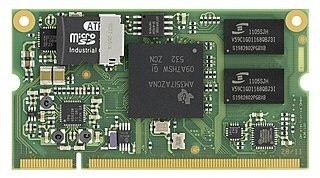 A PowerPC microprocessor is required for the most recent release, AmigaOS 4. AmigaOS 4 is a line of Amiga operating systems which runs on PowerPC microprocessors. It is mainly based on AmigaOS 3.1 source code developed by Commodore, and partially on version 3.9 developed by Haage & Partner. "The Final Update" was released on 24 December 2006 after five years of development by the Belgian company Hyperion Entertainment under license from Amiga, Inc. for AmigaOne registered users. FreeBSD is a free and open-source Unix-like operating system descended from the Berkeley Software Distribution (BSD), which was based on Research Unix. The first version of FreeBSD was released in 1993. In 2005, FreeBSD was the most popular open-source BSD operating system, accounting for more than three-quarters of all installed BSD systems. 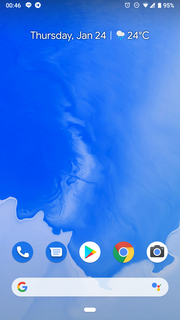 Bada is a discontinued operating system for mobile devices such as smartphones and tablet computers. It was developed by Samsung Electronics. Its name is derived from "바다 (bada)", meaning "ocean" or "sea" in Korean. It ranges from mid- to high-end smartphones. In computing, the Executable and Linkable Format, is a common standard file format for executable files, object code, shared libraries, and core dumps. First published in the specification for the application binary interface (ABI) of the Unix operating system version named System V Release 4 (SVR4), and later in the Tool Interface Standard, it was quickly accepted among different vendors of Unix systems. In 1999, it was chosen as the standard binary file format for Unix and Unix-like systems on x86 processors by the 86open project. A monolithic kernel is an operating system architecture where the entire operating system is working in kernel space. The monolithic model differs from other operating system architectures in that it alone defines a high-level virtual interface over computer hardware. A set of primitives or system calls implement all operating system services such as process management, concurrency, and memory management. Device drivers can be added to the kernel as modules. In computing, cross-platform software is computer software that is implemented on multiple computing platforms. Cross-platform software may be divided into two types; one requires individual building or compilation for each platform that it supports, and the other one can be directly run on any platform without special preparation, e.g., software written in an interpreted language or pre-compiled portable bytecode for which the interpreters or run-time packages are common or standard components of all platforms. Originally, the word computing was synonymous with counting and calculating, and the science and technology of mathematical calculations. Today, "computing" means using computers and other computing machines. It includes their operation and usage, the electrical processes carried out within the computing hardware itself, and the theoretical concepts governing them. A cross compiler is a compiler capable of creating executable code for a platform other than the one on which the compiler is running. For example, a compiler that runs on a Windows 7 PC but generates code that runs on Android smartphone is a cross compiler. In software engineering, a compatibility layer is an interface that allows binaries for a legacy or foreign system to run on a host system. This translates system calls for the foreign system into native system calls for the host system. With some libraries for the foreign system, this will often be sufficient to run foreign binaries on the host system. A hardware compatibility layer consists of tools that allow hardware emulation. Binary-code compatibility is a property of computer systems meaning that they can run the same executable code, typically machine code for a general-purpose computer CPU. Source-code compatibility, on the other hand, means that recompilation or interpretation is necessary before the program can be run. 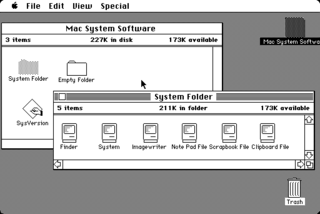 Parallels Server for Mac is a server-side desktop virtualization product built for the Mac OS X Server platform and is developed by Parallels, Inc., a developer of desktop virtualization and virtual private server software. This software allows users to run multiple distributions of Linux, Windows and FreeBSD server applications alongside Mac OS X Server on Intel-based Apple hardware. libvirt is an open-source API, daemon and management tool for managing platform virtualization. It can be used to manage KVM, Xen, VMware ESXi, QEMU and other virtualization technologies. These APIs are widely used in the orchestration layer of hypervisors in the development of a cloud-based solution. The Java Development Kit (JDK) is an implementation of either one of the Java Platform, Standard Edition, Java Platform, Enterprise Edition, or Java Platform, Micro Edition platforms released by Oracle Corporation in the form of a binary product aimed at Java developers on Solaris, Linux, macOS or Windows. The JDK includes a private JVM and a few other resources to finish the development of a Java Application. Since the introduction of the Java platform, it has been by far the most widely used Software Development Kit (SDK). On 17 November 2006, Sun announced that they would release it under the GNU General Public License (GPL), thus making it free software. This happened in large part on 8 May 2007, when Sun contributed the source code to the OpenJDK. ↑ "What I Talk About When I Talk About Platforms". martinfowler.com. Retrieved 2018-03-18. ↑ Andrew Binstock (July 2, 2012). "Google's Redefinition of the Browser As Platform". Dr. Dobbs . ↑ Chip Wilson; Alan Josephson. "Microsoft Office as a Platform for Software + Services". Microsoft Developer Network . ↑ "What Is PAAS?". Interoute . ↑ "Twitter Development Platform - Twitter Developers". ↑ "Facebook Development Platform Launches..." August 15, 2006. ↑ "Platform independence in Java's Byte Code". Stack Overflow.